Alpaca Fiber has always been considered the "Fiber of the Gods"
Alpaca is unlike any other kind of wool product. It has a unique shaft and does not have a picky or itchy feel against your skin. It is soft and luxurious. Alpacas are a rare and exceptional animal, shorn once a year, it takes one full fleece to make each of our pillows! ​According to The Washington Post, federal agencies "often lack the authority and resources to monitor and control...[chemical] hazards. Of the nearly 80,000 chemicals regularly bought and sold today...fewer than 10% have been tested for their capacity to cause cancer or do other damage." Sleep with peace of mind. Luxurious hand-crafted natural, chemical free alpaca filled pillows, covered in luxurious silky organic cotton fabric. Ideal for severe allergy sufferers sensitive to other natural fibers such as sheep's wool, or feathers, which have dander and also break down over time. Alpaca is a healthy luxury! How is Alpaca Fill Different from Sheep's Wool? Alpaca fill is the desired fiber of great designers, once called "The Fiber of the Gods," and only used for royalty. 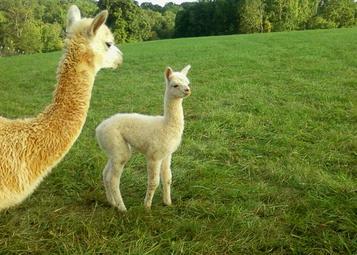 Alpacas are a member of the Camelid family, a descendant of the camel, and most closely related to the llama. People that are sensitive to wool may not have a sensitivity to Alpaca. Unlike wool, Alpaca does not contain lanolin, which may hold microscopic allergens. Our high quality pillows are filled with 100% U.S. Alpaca fiber. Our Alpaca fill is naturally fire resistant and chemical free, a great alternative for allergy suffers, or healthy living families. Your Pillow is the one product in your life that you have direct and constant contact with for several hours every day, and is directly associated with your breathing and your health. And along with alpaca, which is considered the "greenest animal on the planet," you will know quality, luxury, and be safe from harmful chemicals. OUR products are MADE IN AMERICA! Available in 3 fill weights, light, medium or full. when slept on, we consider our medium fill pillows to be soft but supportive. Full fill pillows are perfect for those who may snore or need elevation. Note: Our Alpaca pillows are made to order please allow 10 to 14 days for delivery. We, at the USAlpaca Company have an exclusive line of Organic Luxury pillows made of luxurious Alpaca fill and US Organic cotton that would be perfect for your hotel guests. These are the most luxurious and healthiest pillows on the market. Alpaca is "the fiber of the Gods," and considered the lap of luxury, but boast health properties that are without compare to any other natural product.